Protects sensitive mobile electronics such as mobile phone handsets, smart phones, laptop computers, PDAs, digital cameras and MP3 players. VISHAY Intertechnology, represented in Australia by Braemac , has released two low-capacitance ESD protection diode arrays. They extend the company’s line of ultra-small LLP-packaged products optimised for data-line protection in portable electronics. The VESD05A8-HN2 is packaged in the 2mm x 2.0mm LLP70-9A. It has nine contact pads and a monolithic die with eight protection diodes. The array provides bidirectional asymmetrical protection for eight data lines, or bidirectional symmetrical protection for seven data lines. The VESD05A6-HA3 is packaged in the 1.6mm x 1.6mm LLP75-7A and has seven contact pads and a monolithic die with six protection diodes. The array offers bidirectional asymmetrical protection for six data lines or bidirectional symmetrical protection for five data lines. The leadless SMD arrays meet a high industry standard for ESD protection, supplying transient protection of 30kV (air) and 30kV (contact) as per IEC 61000-4-2, as well as 5A protection against lightning as per IEC 61000-4-5. 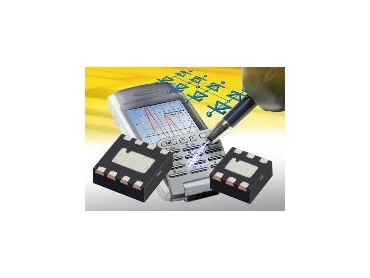 Their low capacitance minimises distortion to the operating signal on protected lines. The VESD05A8-HN2 and VESD05A6-HA3 protect sensitive mobile electronics such as mobile phone handsets, smart phones, laptop computers, PDAs, digital cameras and MP3 players against electronic discharge pulses caused by user contact with displays and keypads. They also protect power supply and data transfer connections against discharge spikes. The devices offer protection in a single compact package saves space and reduces manufacturers’ component costs.